Photo of Crescendo by Norman Rockwell Museum. Stockbridge, MA, November 9, 2018—Norman Rockwell Museum will celebrate the 75th Anniversary of Norman Rockwell’s Four Freedoms with the musical performance Paintings in Song, to be held at the Museum on Saturday, November 24, starting at 5:30 p.m. 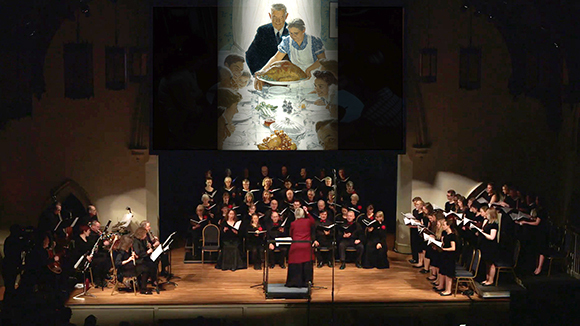 Inspired by Norman Rockwell’s art, Paintings in Song is being performed by choral ensemble Crescendo, led by artistic director Christine Gevert and Berkshire-based composer John Myers. Paintings in Song will highlight the continued cultural relevance represented in Rockwell’s Four Freedoms and other significant works. The event is free for Museum members and children 18 and under, or included with regular Museum admission.